The basin is moulded in a flanged, five-lobed form, the unglazed base is recessed to form a shallow foot and there is a further shallow, circular glazed recess in the centre bearing a six-character mark. 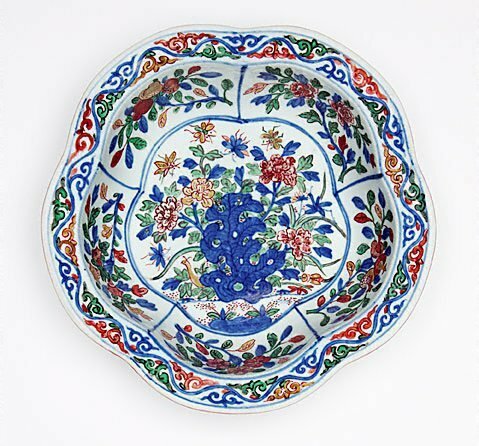 The decoration, within and without, is in a vibrant purplish underglaze blue and red, green, brown and black overglazed colours in the wucai or five colours style. In the centre is a cluster of exotic flowers issuing from a large taihu rock. Each of the five shaped panels of the cavetto is also decorated with flowering and fruiting branches. Around the flattened rim is a continuous scroll. On the exterior is a peony scroll. 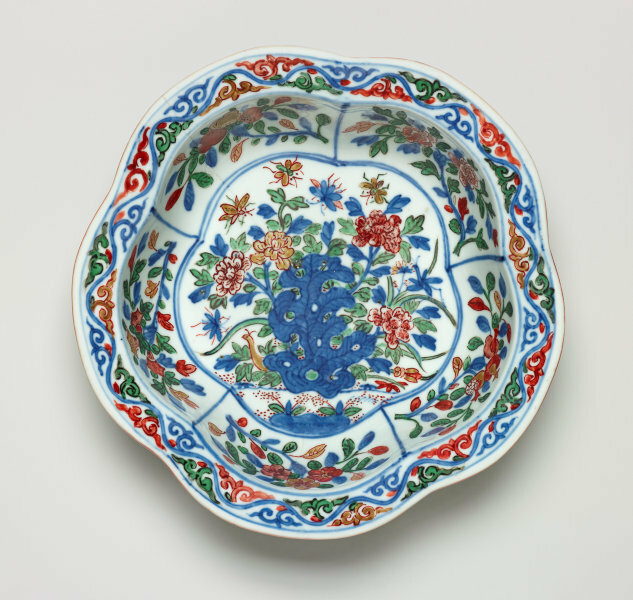 Wucai decoration, a combination of underglaze blue and overglaze polychrome enamels, was an important innovation of the Jiajing period (1522-1566), and was one of the last major additions to the lexicon of ornamental techniques that were developed during the Ming dynasty. The wucai porcelains produced during the Wanli period are outstanding. The wucai pentafoil basins in the size of present one are particularly rare. Asian Art Dept, AGNSW, June 1999. Edmund Capon, Look , 'Asian ambitions', pg. 12-13, Melbourne, Oct 2000, 12 (colour illus.). Article about new building plans and the new Asian Gallery to be completed by 2003.